Strange though it may sound, I have been dreaming of this day for months. Huddled under a pile of blankets in the depths of winter, I couldn’t get rhubarb out of my mind. Perhaps it was the thought of all those things that rhubarb season brings with it — warm weather, gardening, not having to wear five layers of clothing to keep warm — but whatever the reason, I was stuck on it. Before I go rushing off to make a pie, though, I thought I’d start with something a little different. Like, rhubarb and lime simple syrup, for example. This syrup may be simple, but it’s got a lot going on. For one, it comes in the most gorgeous shade of red, which was completely unexpected even to me. Looking at the pot of bubbling rhubarb, I was pretty certain it was going to be a muddy, flesh-toned disaster. Then I strained it, and watched this ruby syrup pour down into my jar. I promise I haven’t enhanced the color in these photos at all — in fact, I had to tone it down a little in the one above — that’s how bright it is. Just as bright and unexpected as the color, is the flavor. All the tartness of rhubarb and lime, turned into a sweet, floral, and balanced syrup. Sweet enough that you’ll want to lick drops of it up off the counter, but sour enough to add a hint of complexity to whatever you want to add it to — which will be everything. 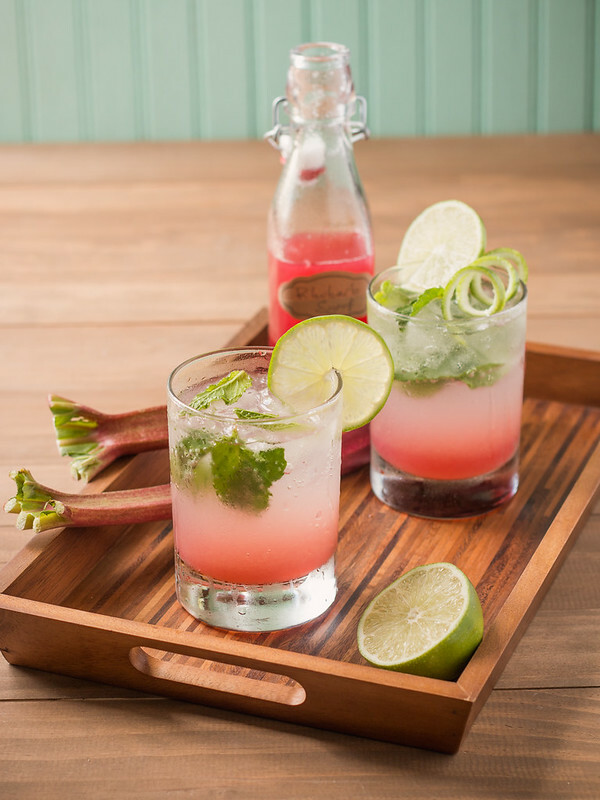 As you probably already know, mixing cocktails has become one of my favorite creative outlets as of late, so I couldn’t resist using this rhubarb syrup to put a spin on a classic mojito. However, it tastes just as good mixed with a little club soda, ginger ale, seven-up, or lemonade, sans the booze. You could even muddle a little mint in there and call it a virgin mojito, if you’re feeling fancy. However you do it, it’s guaranteed to be delicious. Either way, however you choose to use it, you should definitely be making this syrup this weekend. 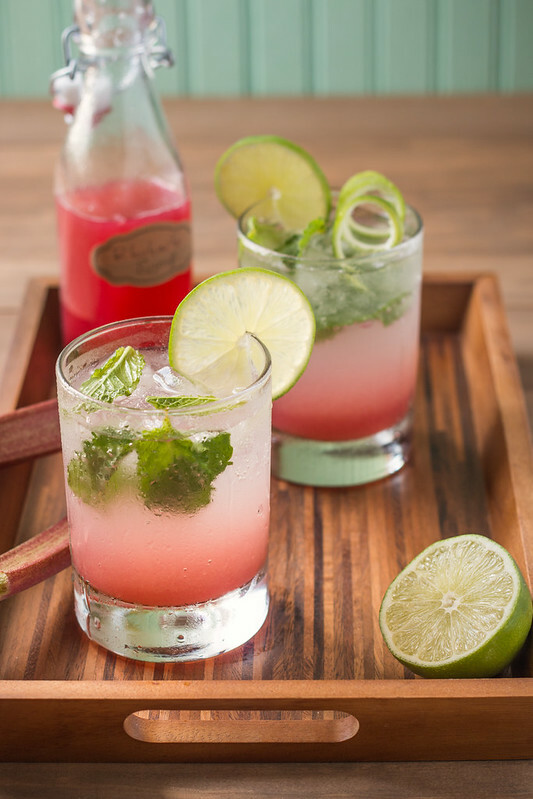 Rhubarb sodas and mojitos for everyone! 1. In a small saucepan, combine the rhubarb, lime zest, sugar, and water. Bring to a boil, then reduce the heat to low and simmer for 25-30 minutes, or until the syrup has thickened slightly, stirring occasionally. 2. Strain the syrup through a fine mesh sieve or cheesecloth, and pour into a clean jar. Stir in the lime juice, and let cool. Syrup should keep in the fridge for at least a couple of weeks, or can be frozen in an ice-cube tray indefinitely. 3. To use, mix 2-3 TBSP syrup per 8 oz. of club soda, seven-up, lemonade, or other beverage. Or, spoon over ice cream, drizzle over pound cake, or take by the spoonful (side effects may include: feeling spontaneously happy, smiling uncontrollably, and in severe cases, squealing with glee). 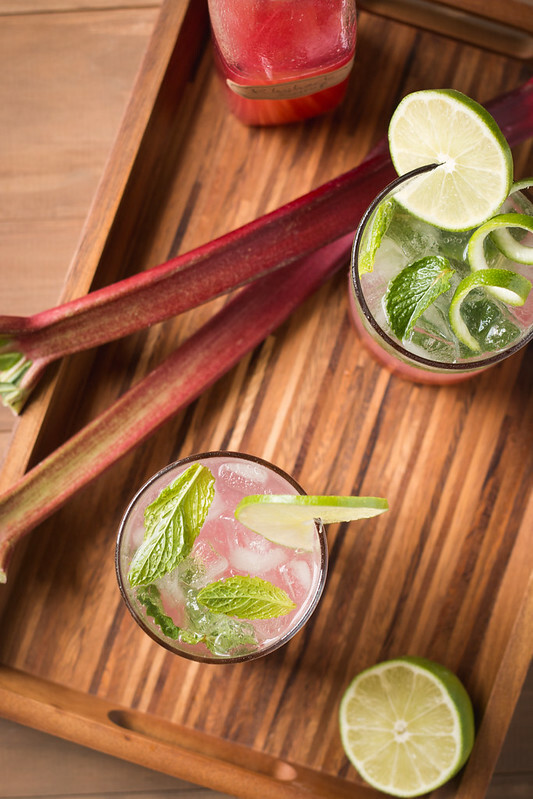 Or, follow the recipe below for Rhubarb Mojitos. 1. In a cocktail shaker, muddle together the mint, basil (if using), rhubarb syrup, and rum. Add ice, and shake until well chilled. 2. Pour into an ice-filled glass, and top with club soda to taste. Garnish with extra mint, basil, or lime wedges. Wow – look at that color! The syrup is absolutely gorgeous – Really makes the whole drink pop! Thanks, Shelly! Isn’t it gorgeous? I still can’t get over it. CHEERS! Will you be my bartender? Perfect for weekend!! I am making these! This rhubarb syrup is so pretty!!! (i’m a sucker for anything pink). Mmmm, so many delicious drinks you could make with this. Loving this recipe! The rhubarb and lime syrup looks amazing. We love sipping cocktails in the summer and our 2 daughters always want something ‘pretty’. That translates to pink. We can now use this for adult and kiddie drinks. Thanks, Chris! This is the perfect drink for kids and adults… I hope you and your daughters like it! Just back from a sunny vacation. It was a big hit. They felt very COOL! So pretty! 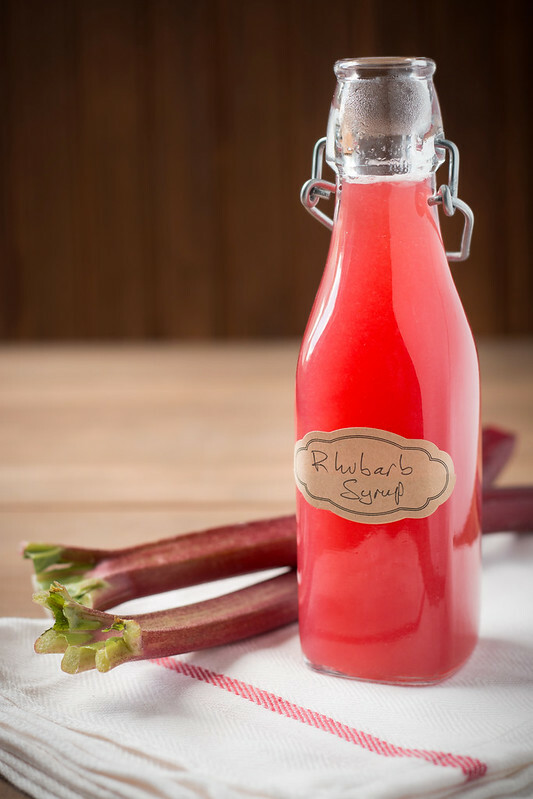 I absolutely adore rhubarb and this syrup is probably the most creative ways I have ever seen it used, pure genius- I think I am totally inviting myself over so you can mix me up one of these!